KS Partners and the @Brickstone Square community would like to extend a cordial invitation to all residents of Andover and neighboring towns to our 2018 Tree Lighting @Brickstone. 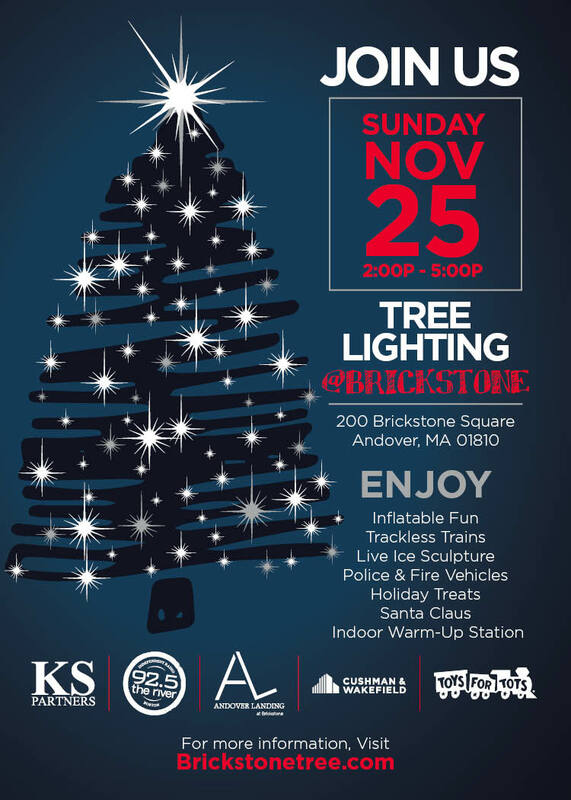 On Sunday, November 25 at 2pm, after the Andover Santa Parade, KS Partners is hosting a Tree Lighting at their Andover Brickstone property. The all-ages event is free and open to the public. Join the @Brickstone community and 92.5 The River from 2-5pm for an afternoon of inflatable fun, Santa, prizes, holiday treats, trackless trains, police and fire vehicles, kid’s crafts, a live ice sculpture demonstration, musical performances, and more. Many in the Merrimack Valley remember when the Tree Lighting @Brickstone was a highly-anticipated annual event. Each year a 100-foot tree was flown in and decorated for the whole community to enjoy. The Brickstone tree was the largest Christmas tree in the country at the time, towering over those of the White House and even New York’s Rockefeller Center. Learn more about the original event here. 15 years ago, the previous owners of Brickstone Square opted to take a break from the event, as cutting down an enormous live tree each year was problematic. 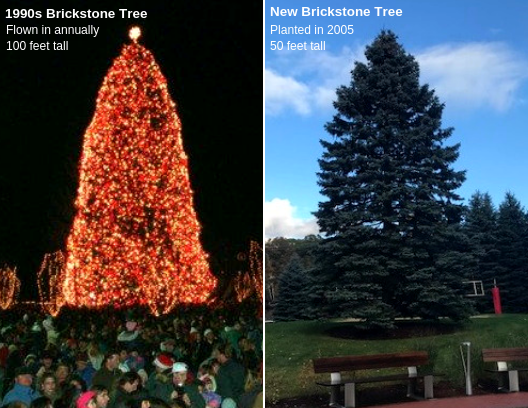 Eventually in 2005, a 12-foot blue spruce tree was planted @Brickstone in hopes it would someday grow tall enough to reinstate the beloved tree lighting ceremony. KS Partners believes the time has come. The tree is now over 50 feet tall, and we can’t wait to share it with the community! “We’ve wanted to bring back this beloved tradition at Brickstone for some time. We’re overjoyed to bring together the residents of Andover and neighboring towns to lift the community’s spirits, especially after the recent Merrimack Valley Gas Fires and resulting aftermath,” said KS President and founder Kambiz Shahbazi. KS Partners has officially partnered with 92.5 The River and the River Roadies Street Team to host the event. The new, 50-foot Brickstone Tree will be illuminated at sunset on Sunday, November 25. We can’t wait to usher in the 2018 holiday season with you!